Ferocactus wizlizenii species of barrel cactus may bear ripe fruit two to three times per year. Today’s post is by Jacqueline Soule. Here in the Southwest, there are more than enough native plants to grow that will also provide food for the table – at least partially. 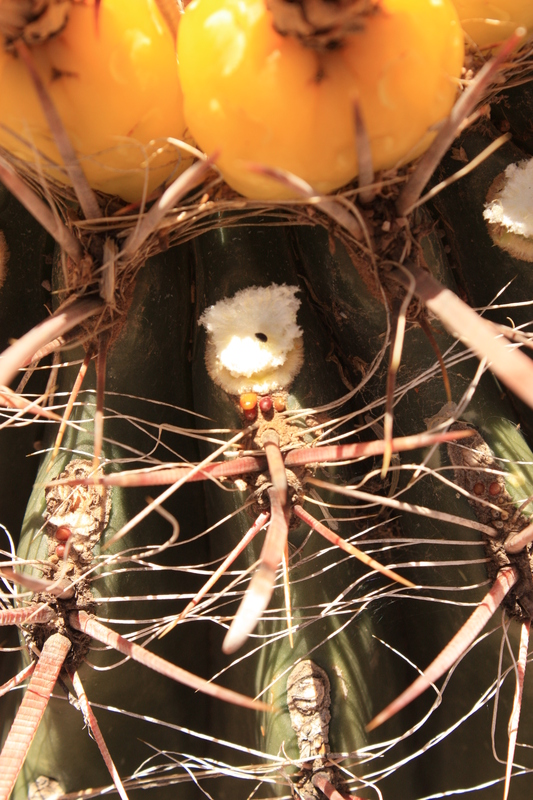 One that has a hidden bounty at this time of year is the barrel cactus. Barrel cactus is the generic term for a number of species of large barrel-shaped cacti. 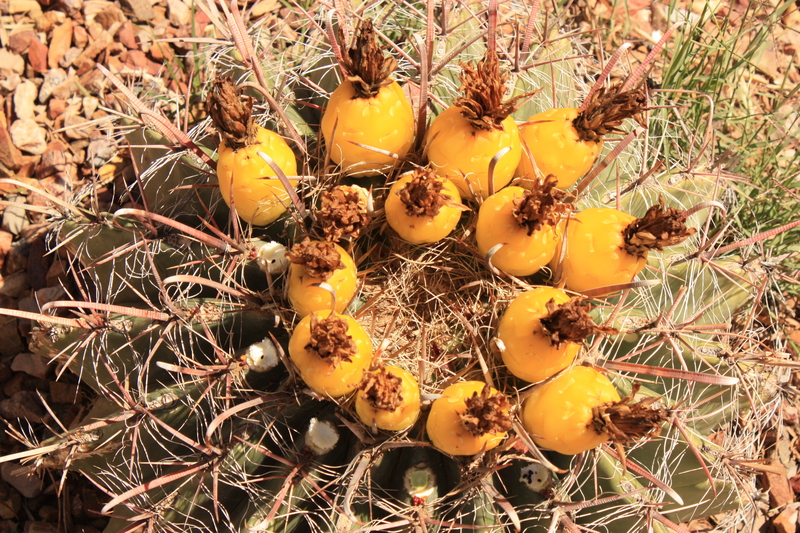 The one with the most edible of fruit is the fish hook or compass barrel (Ferocactus wizlizenii). 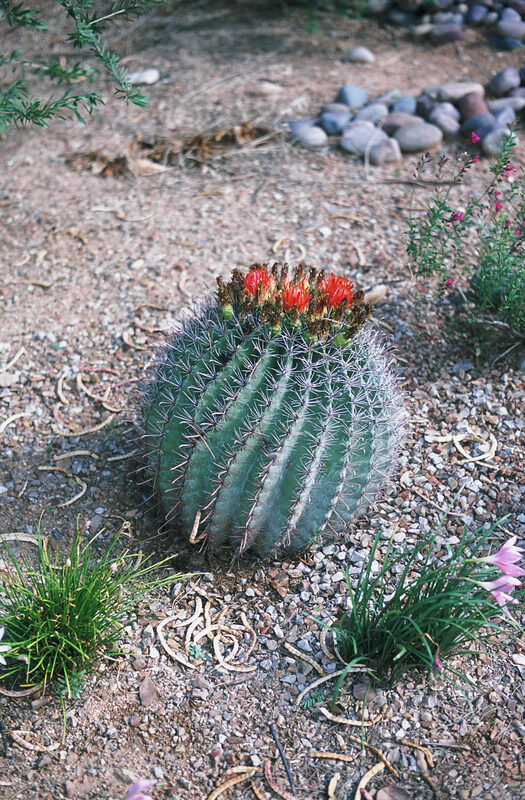 This barrel cactus is unlike many other species of cacti in that it often blooms two or even three times per year, thus providing you, the harvester, with ample fruits, often several times a year. Barrel cactus can make a lovely addition to the low-water landscape. There are a number of different varieties now available in the nursery trade. Note the bluish cast to this individual. After the blooms, the fruit slowly develop, turning from green to yellow when ripe. They are easy to harvest, simply grasp the stiff spent flower that remains on the fruit and pull. The fruit comes right off when ripe. If you have to apply great force, Mama barrel cactus is telling you this fruit is still green and she is not ready to cut the apron strings. When fruit – any fruit – is ripe, the parent plant forms an easily severed abscission layer. If you have to apply great force, the fruit is not ripe or ready to harvest yet. You can eat the lemony flavored fruit, but only in moderation. Fruit is high in oxalic acid, which can be hard on human systems. 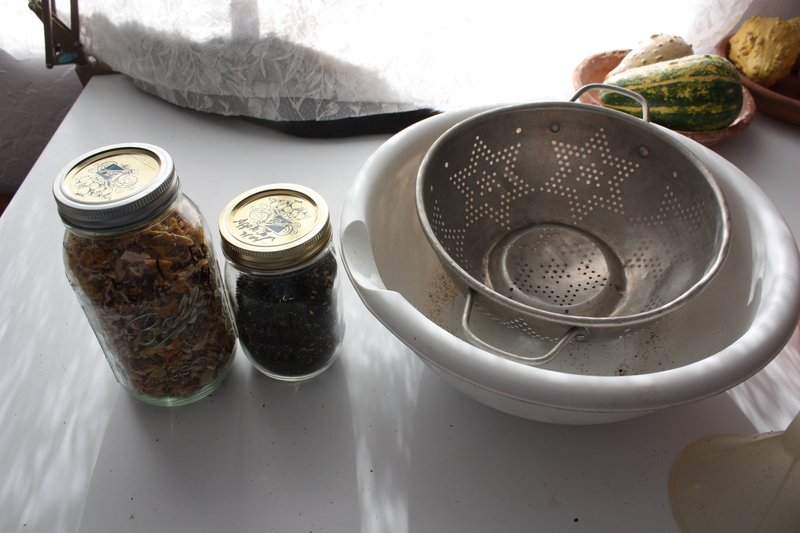 I do dry the fruit and use them as I brew iced tea – in place of lemon. You can also mix the dried fruit with dried hibiscus blooms to make a delightfully tart and refreshing summer drink. 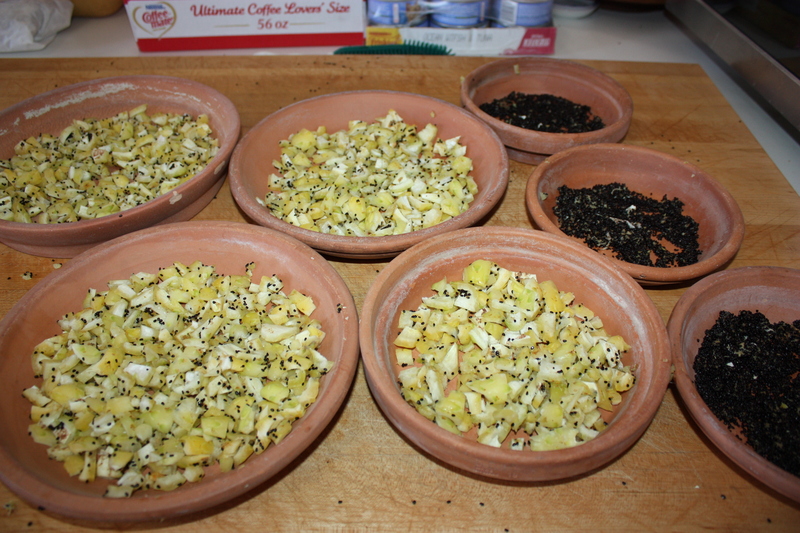 For ease of drying, a single thickness of diced fruit can be laid in terra cotta saucers. One week later, the fruit is entirely dry and much shrunken in the saucers. Be sure to dry out of direct sunlight. You can shake the dried fruit in a colander and collect additional seed that previously clung to the moist fruit. As I cut open the fruits, I do harvest the seeds – which are safe to consume in quantity. 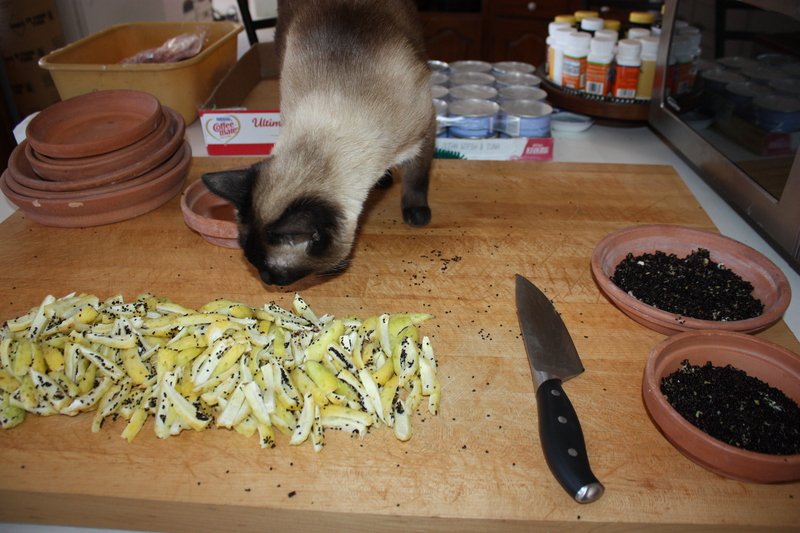 They are the size, texture and taste of poppy seeds and can be used anywhere you use poppy seeds. Like poppy seeds, they are best when toasted for 30 to 45 minutes at 300 degrees F. Toasting them makes them a easier to crunch open so you can digest them more fully. 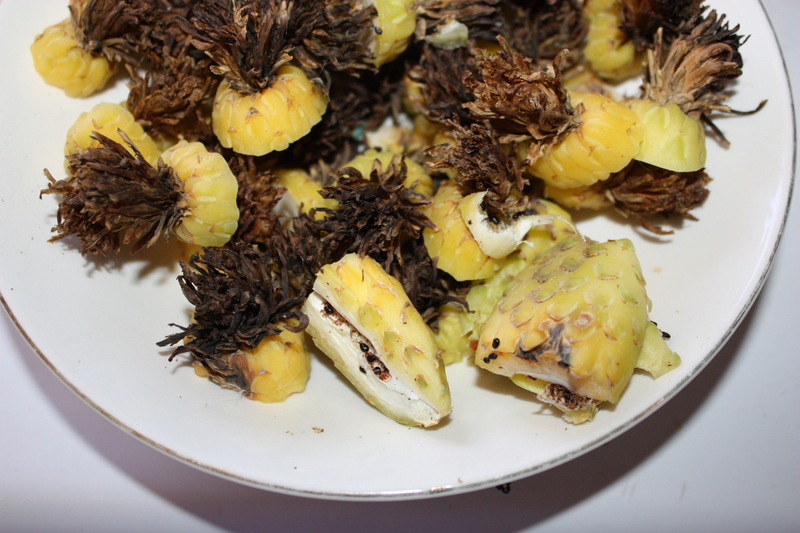 The fruit is somewhat mucilagenous and the seeds may cling to them as you slice them for drying. Mix the dry ingredients, add the wet ones, blend well and pour into a glass loaf pan. Microwave for at least 3 minutes, and perhaps up to 4 minutes. It takes 3 minutes 15 seconds in our microwave. Run a knife around the edges and tip it out of the pan right away. ((I just thought, maybe you can grease the cooking dish?! I will have to try that!)) Optionally you can frost this cake once it cools or drizzle it with a light icing. Makes a quite elegant coffee cake. You can also cut this recipe down to one quarter (one egg) and cook it for one minute in a microwave safe mug to make a single serving muffin. 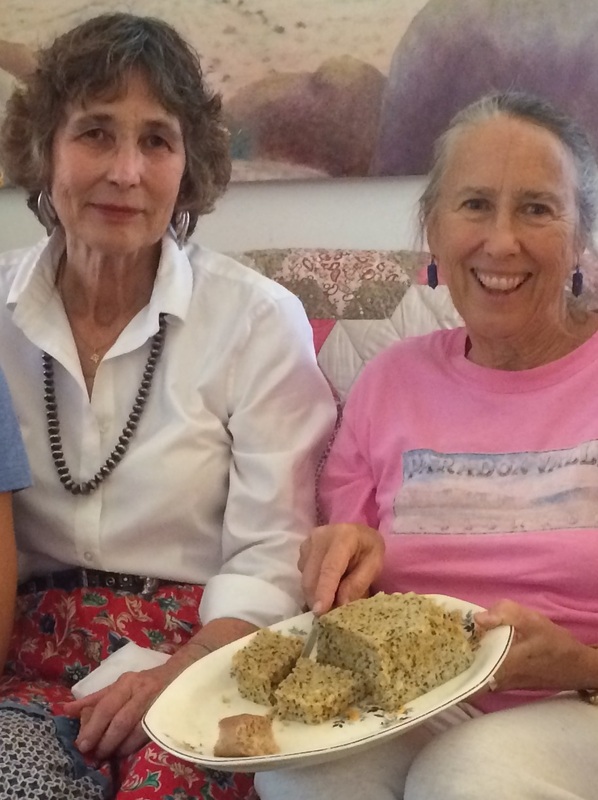 Carolyn Niethammer and Muffin Burgess enjoy Lemon Barrel-Seed Cake at our Anniversary Tea. Barrel fruit are an often overlooked fruit by desert harvesters, but hopefully this article will give you some ideas for their use. Please feel free to share your ideas! If you are concerned about the oxalic acid in the fruit, you could pluck the fruit, scoop out the seeds and return the fruit to the desert for the native wildlife to enjoy, much the way you harvest saguaro fruit. Just be certain that the fruit lands open side up to help encourage the rains. 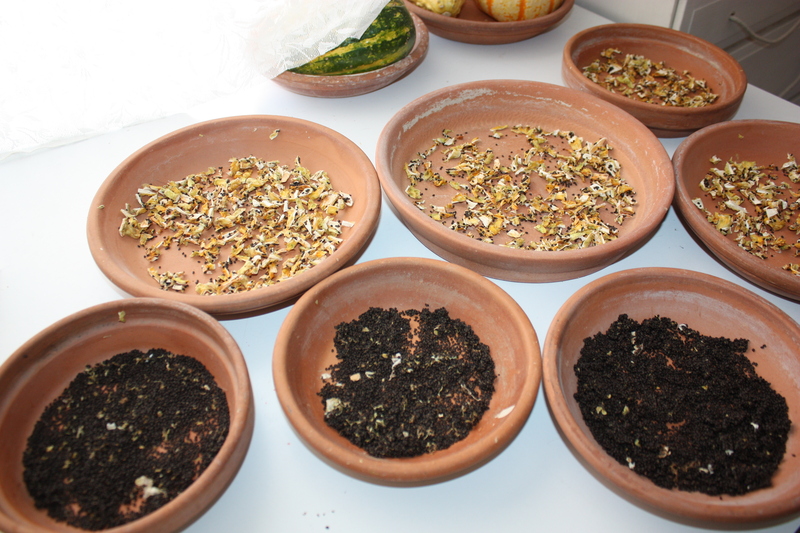 If you prefer, you can keep only the seed and compost the fruit, or return it to the desert for the critters to eat. If you live in Southeastern Arizona, please come to one of my many free lectures. Look for me at the Pima County Library, Steam Pump Ranch, Tubac Presidio, Tucson Festival of Books and more. After each event I will be signing copies of my books, including the latest, “Southwest Fruit and Vegetable Gardening,” written for Arizona, Nevada and New Mexico (Cool Springs Press, $23). All photos and text are copyright © 2014, Jacqueline Soule. All rights reserved. I have received many requests to reprint my work. My policy is that you are free to use a very short excerpt which must give proper credit to the author, and must include a link back to the original post on our site. Photos may not be used. Please use the contact me if you have any questions. 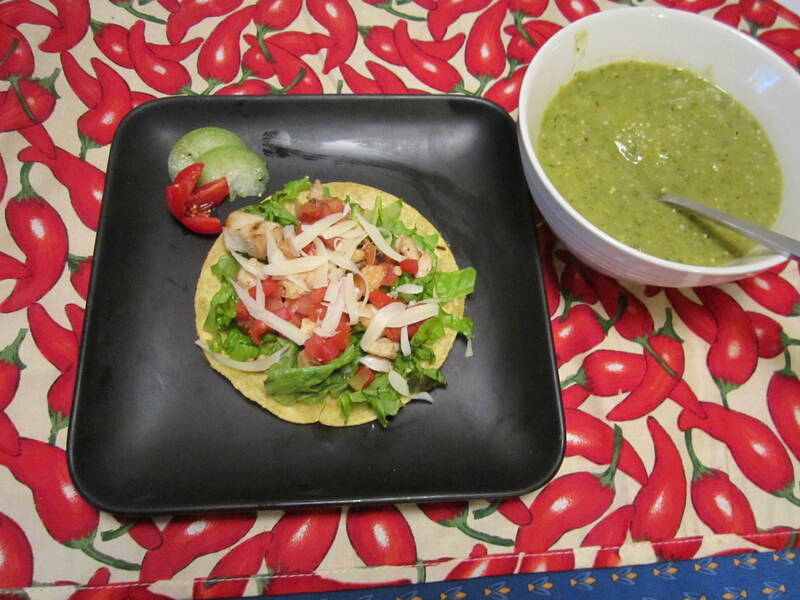 Salsa Verde is the perfect addition to a tostada. When I was interviewing chefs for my book The New Southwest Cookbook back in 2005, tomatillos were the vegetable du jour — every chef had them on the menu, usually “blackened” or roasted to heighten the flavor. I gained new respect for how versatile they are. I planted six tomatillo plants in August and hoped for a plentiful harvest, I even dreamed about making enough green salsa to can or freeze. Alas, my homegrown tomatillos were so tiny they weren’t worth the trouble and I ended up buying tomatillos grown by a farmer who had a better technique. In Mexico the tomatillo is called tomate verde, which means “green tomato.” However, tomatillos are not just small, underripe tomatoes, but a distinct vegetable in their own right. 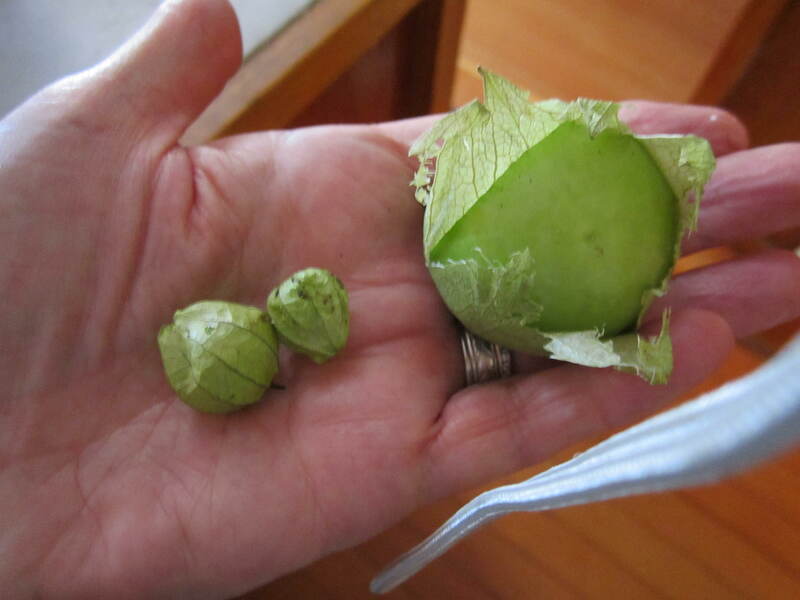 Tomatillos are the size of an apricot and covered with a papery husk. They are meatier and less juicy inside than a tomato. Tomatillos are an essential part of Mexican cuisine and have been since the Aztecs domesticated them. Most tomatillos are harvested slightly underripe when then have a tart, slightly lemony flavor that adds zip to salsas. As they fully ripen they turn more golden and become sweeter. Tomatillos are the main ingredient in the classic salsa verde which includes tomatillos, sliced green onions, green chiles of some variety, garlic and cilantro. Salsa verde can be served raw or very lightly cooked. 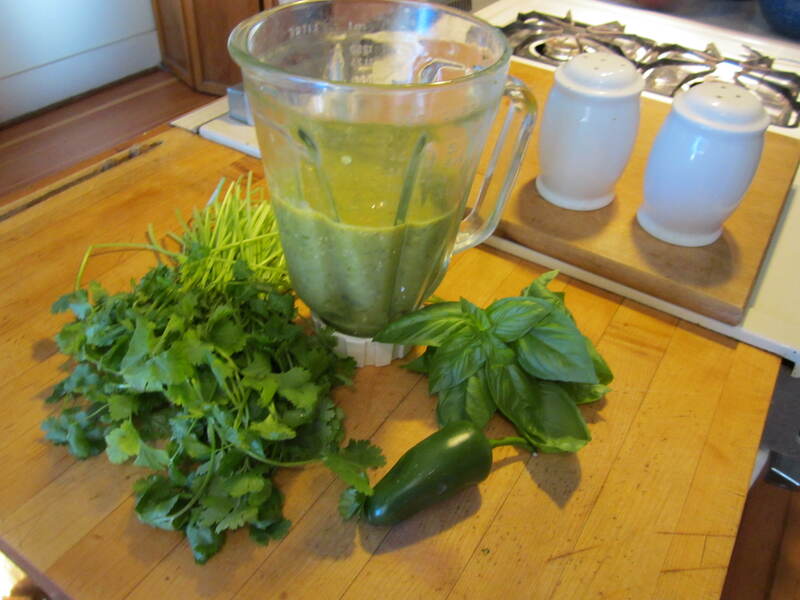 Of course, you can always put your own spin on salsa verde by using the herbs you have fresh in your garden. 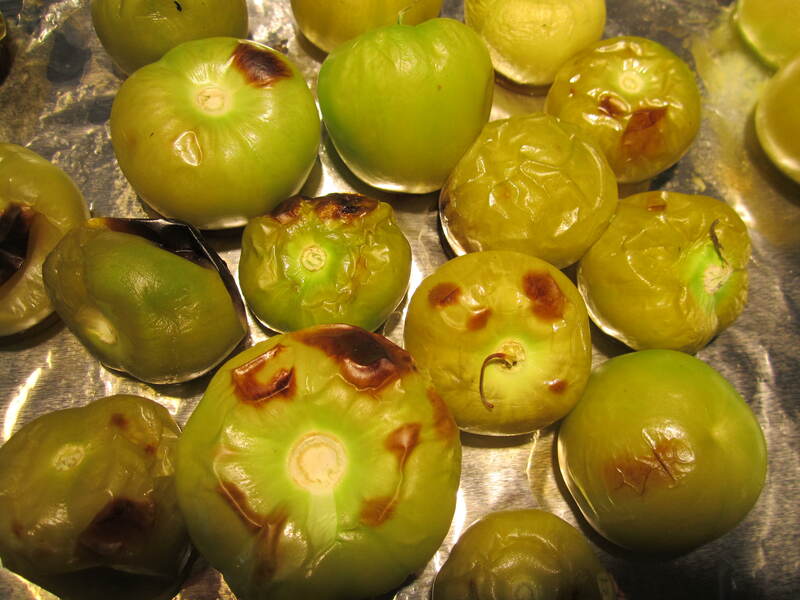 To prepare tomatillos, remove the husk and rinse off the stickly substance on the skin. Rub them with a little oil and then put them under the broiler until they are soft and just slightly brown. Roast the tomatillos until soft. 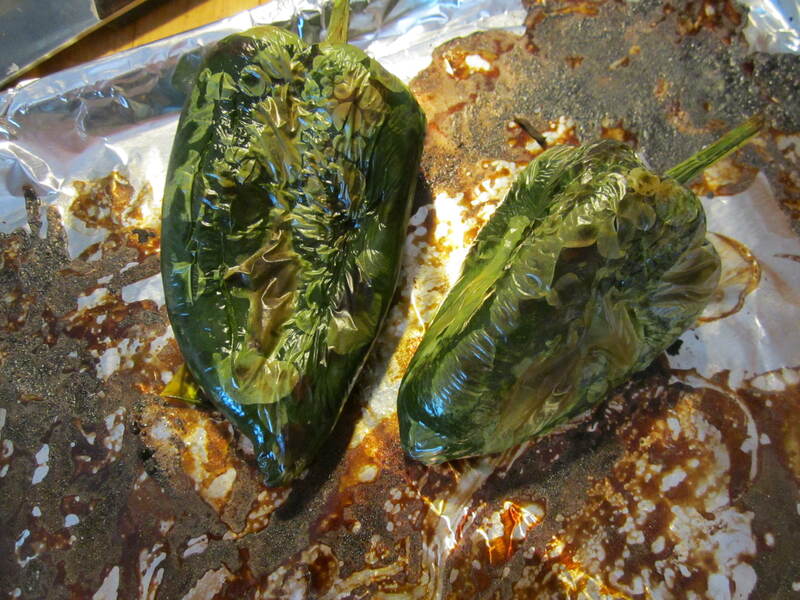 I love the flavor of poblano chiles in anything, so I roasted a couple of those while the tomatillos were cooling. When their skins were charred on all sides, I put them in a paper bag to sweat for about 10 minutes (OK, 5 minutes, I was impatient). This makes them easy to peel. Also take off the stem and the seeds. Next it is time to get creative. Put your tomatillos, skin and all into the blender with some sliced green onions, some peeled garlic cloves, and the peeled chiles. If you want a little more heat, add a half or whole jalapeno, chopped. (And of course you remember to use gloves while chopping the jalapeno and don’t touch your eyes.) Add some chopped cilantro. I had some lovely fresh basil, so I added that as well. Blend well until you have a nice smooth consistency. The chef at Medizona, a top Scottsdale restaurant, added a little apple juice to mellow out the tartness. Blend together tomatillos, chiles, onions, garlic and herbs. So now you have this wonderful salsa. How to use it? Try it on tacos or tostadas (photo top of post) or as a sauce for chicken, pork chops or even shrimp. 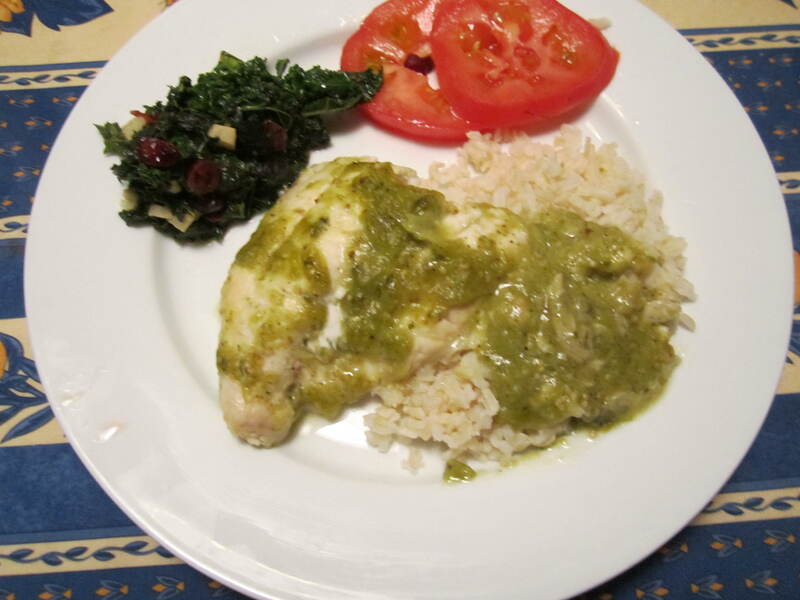 Salsa Verde on broiled chicken. 1. Remove husks from tomatillos, wash and rub with oil. Put under boiler until soft and slightly browned. Let cool. 2. Broil or grill poblano chiles until all sides are charred. Sweat in paperbag until skins remove easily. Peel and deseed. 3. Combine all ingredients in a blender and whirl until smooth. If using on hot food, heat in a saucepan before serving. And just for fun, here’s a garnish tip I learned from Chef Janos Wilder. Carefully loosen the husk from tomatillos, peel them back and you have a lovely flower. 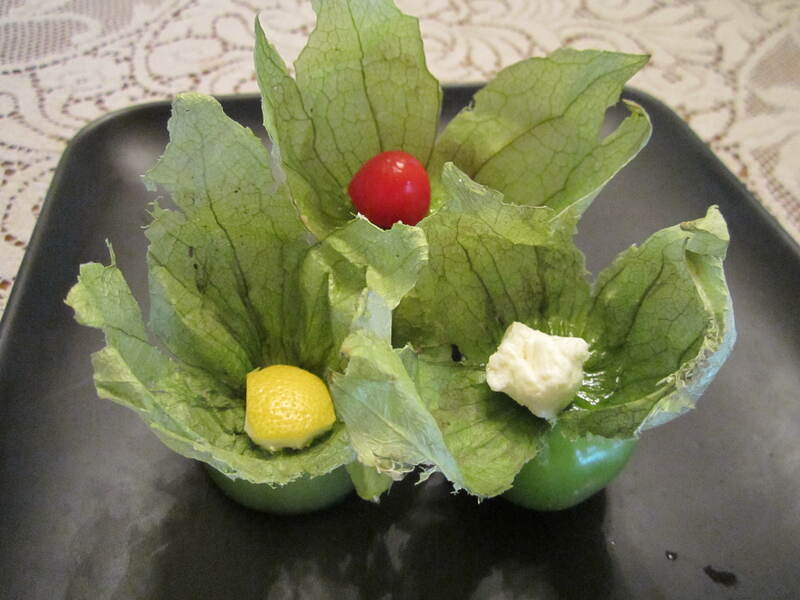 They are a great addition to a cheese plate or relish tray for a party. For more great Southwestern recipes using local ingredients or fruits and vegetables from the wild, check out my cookbooks Cooking the Wild Southwest (University of Arizona), The Prickly Pear Cookbook (Rio Nuevo Press), or The New Southwest Cookbook (Rio Nuevo Press). “Home for the holidays” takes on even more significance than ever this year if we invite food to our table that has been born and raised here in Baja Arizona—in addition to our loved ones feasting with us. Tia Marta here to share festive ideas for using two of our most exciting local staples—mesquite meal and White Sonora Wheat—in holiday baking. And, even more importantly, I provide access to these lovely local and often hard-to-find ingredients, ready for your culinary creativity! Delicious Arizona velvet mesquite meal, with its naturally sweet complex sugars (that actually help balance blood sugar!) is available at Native Seeds/SEARCH (3061 N Campbell, Tucson) and at our Flor de Mayo booth at Sunday St Phillips farmers’ market (N Campbell at River Rd). We mill it either as natural meal, or roasted, which has a glorious chocolate-y flavor almost like its bean-tree counterpart,carob or St John’s bread, from the Mediterranean region. Our natural mesquite meal is considered a raw food for those on a raw foods diet. We mill it with a cool method taking hours instead of minutes, unlike most hammermill methods which heat the pods with rapid grinding thereby caramel-izing the sugar content. 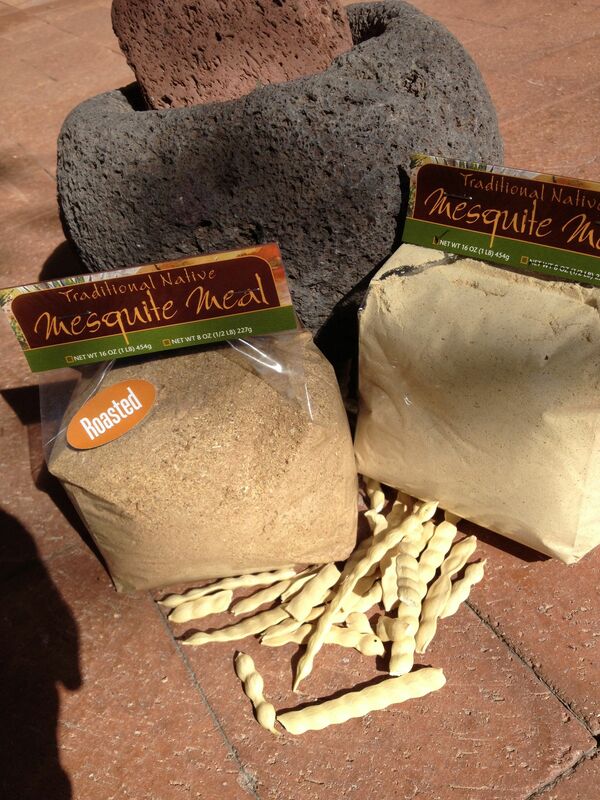 Both our raw and solar-roasted mesquite meals are so fine they can be used as flour. Happily, they sift and cook easily the way one might cook with whole wheat flour. The trick with mesquite meal cookery is to not use too much, as it is so rich. My rule of thumb is: In recipes for baking, substitute mesquite for up to one quarter of the flour called for in the recipe. Both flavor and nutrition remain even if you are more sparing than this—for example substituting 1/6 or 1/8 mesquite for other flour. Use your own taste as the test. Even a small percentage of mesquite can give a great “bouquet” flavor and many nutritional benefits of dietary fiber, protein, and complex carbs for sustained energy. Mesquite has no gluten so it can be a welcome flavor-enhancer in gluten-free recipes using more bland rice or amaranth flours, or to pleasantly over-ride the beany bouquet of garbanzo flour. My favorite combo of all is mesquite with almond meal. Here’s an idea for a delicious gluten-free tea cake for holiday potlucks—a generous option to share with wheat-free pals. This one can be a heavier cake, and if it turns out more like a brownie or energy bar in your oven, that’s fine too! Preheat oven to 350 degrees. Lightly oil an 8×8” pyrex baking dish and dust with rice flour. Pour into baking dish. Bake 25-35 minute or more until it tests done. 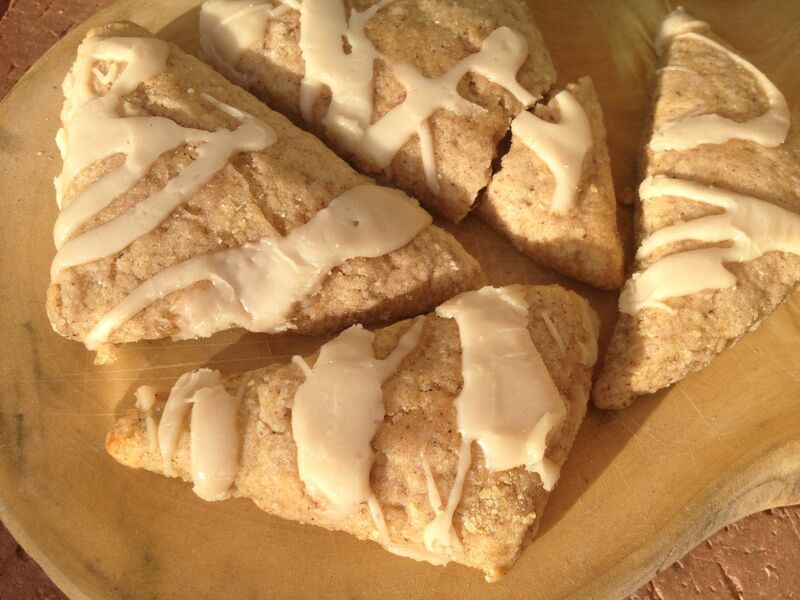 Serve with hot tea and thanks to the bean trees! 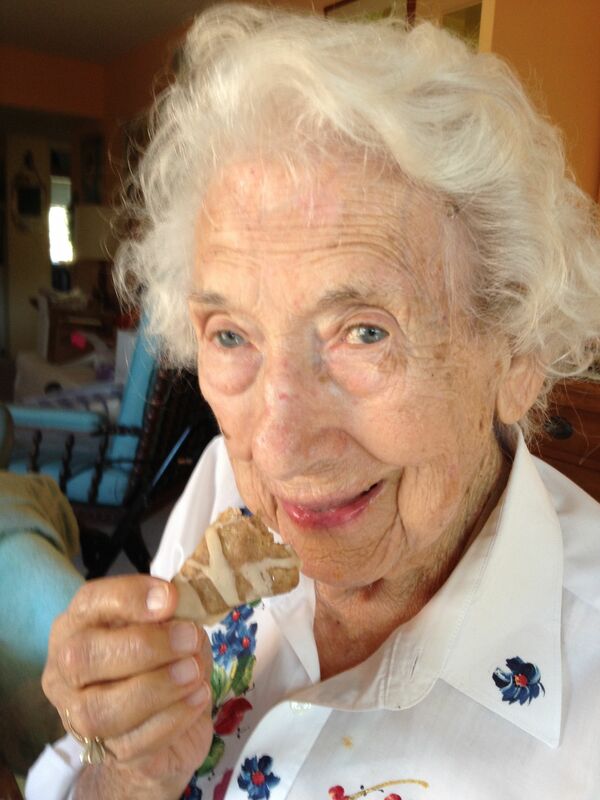 Sonoran Shortbread Recipe – with Heirloom White Sonora Wheat and Mesquite! If your flour is fresh-milled you may need to play around with recipe quantities. Blend dry ingredients into butter. Pat dough into an ungreased 9×9″ baking dish, pressing down with fingers. Pierce dough with fork at 1/2” intervals. BAKE 25-35 minutes. Cut in small bite-sized squares to serve. For extra fancy desserts, top with whipped cream (or vanilla ice cream) and fresh strawberries. Share at a party and enjoy the new “old” tradition with a dose of nutrition to boot! 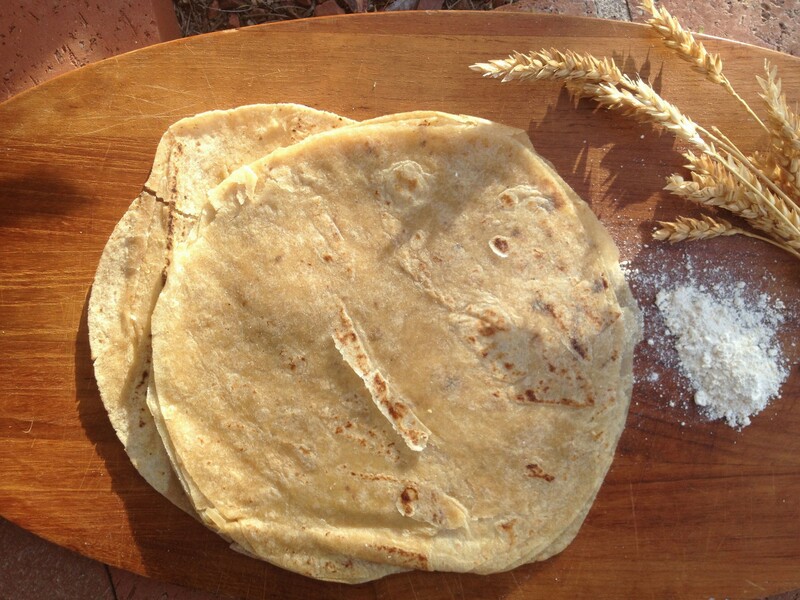 If you are a do-it-yourselfer in the kitchen, and you want the freshest wheat-flour for baking or tortilla-making, we can help you with access to live fresh flour. 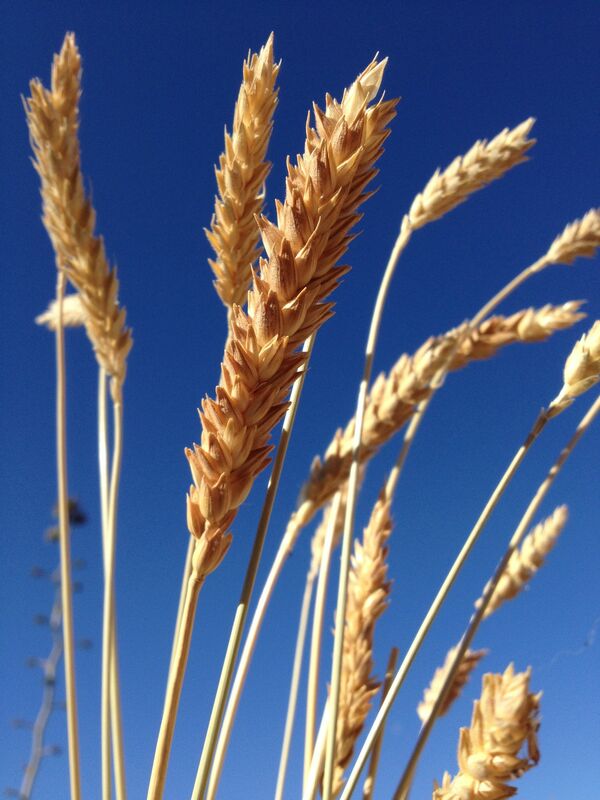 Within a few days of milling, flour retains nutrients and vitality of the living seeds from which it was ground. Those live-food benefits are gone from flour transported and left on store shelves even a short time. Solution: Buy local. If you can contact me—with response—by the Friday before Sunday’s farmers’ market, I can mill organic White Sonora Wheat, grown by BKWFarms locally, fresh for your baking, for you to pick up at Sunday market. Phone me at 520-907-9471 with your milled-flour request. Move over, King Arthur! You can’t get it any fresher unless you have your own mill. If you have a hand-crank grain mill, electric grain mill, or appropriate Vita-mix, you can find heirloom whole White Sonora Wheat-berries at the NativeSeeds/SEARCH store (www.nativeseeds.org), or from Flor de Mayo (www.flordemayoarts.com), and at the Flor de Mayo Sunday market booth. 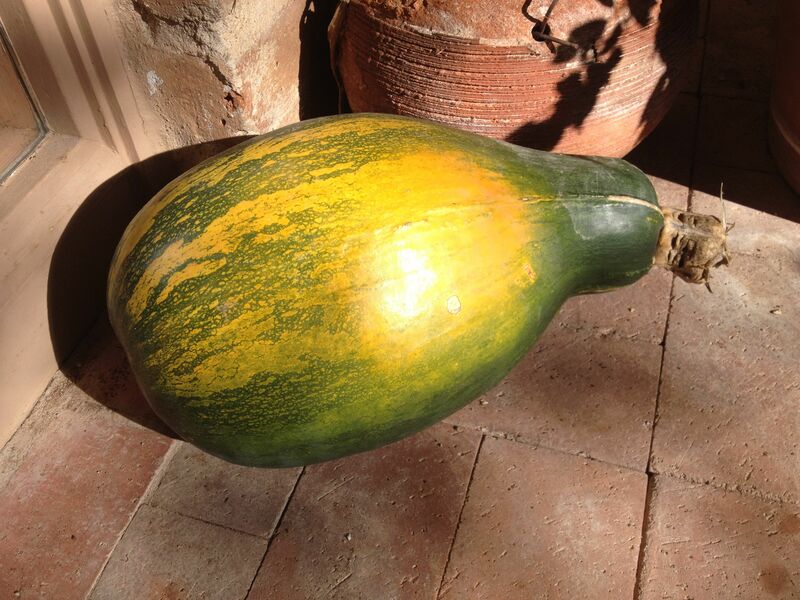 Do visit our Flor de Mayo tent on Sunday’s St Phillips market under the mesquite trees for some treats-du-jour and some White Sonora Wheat goodies like tortillas and pumpkin scones to take home, plus giant Tohono O’odham pumpkins grown at San Xavier. For the next few Sundays we will feature (tah-dah) the most delectable, local, totally organic White Sonora Wheat tortillas you ever tasted. Talk about real! 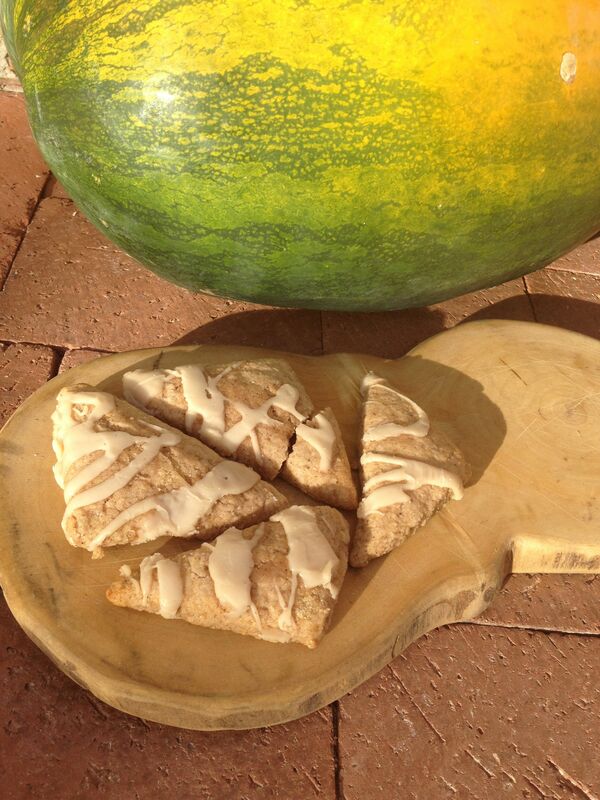 And try our White Sonora and Tohono O’odham Pumpkin scones, made with native local Tohono O’odham Ha:l cushaw squash, rich in beta-carotenes. Where else but Tucson could one find such delicacies? This is why Tucson really should be named an International City of Gastronomy—because we cherish and grow and use our amazing desert-adapted, delicious native foods! Come and enjoy some tastes with your coffee or tea at St Phillips Square or carry them home. May our local Mesquite and White Sonora Wheat add joy to your holiday table and guests, with a bow to harvesters and farmers from the past, and a hopeful look to the future for sustainable desert agriculture! Aunt Linda here, on this breezy Tucson morning. As I write, the full moon shines powerfully in the west, as it sets. The bee yard is aglow. The beams of moonlight bounce off the hives; alight upon the honey house roof; shine through west facing doors and windows. The bees are hunkered down in their hives this morning. They will not launch into their foraging flights as early as they did in the summer. They are solar beings, and navigate with the sun. Being past the equinox , and with less sunlight available, their first flight begin later and their return home in the evening, earlier. They are also affected by cooler temperatures, and are not partial to the winds we have been having. We are all, bee and human, between night and day; between summer and winter. As the cycles of flow and blossoming constantly change, so do the stores of nectar, pollen and honey within the hive. The “inside” of a hive here in Tucson reflects the light yellow color/light aroma of Mesquite Flows from earlier in season, to the darker, stronger tasting and smelling honey of desert wildflowers of late summer and fall. The pollen comes in different colors as well. So it is that bees, in the process of their practicality, create mosaics of pollen and canvases of honey, depending on what is available to them regionally and seasonally. Below: you can see the variation of color and texture of pollen both on the bees’s “pollen baskets” on their hind legs, as well as in their “mosaic” of pollen stores within the hive. See how this desert wildflower yields a bight orange colored pollen (back legs of bee) as compared to the lighter yellow in the above photo. By now you may be reveling in all the colors and tastes (and smells!) of honey. Visit your local beekeeper at a farmers market or health food store this weekend, and see how real and raw honey differs from the “honey bear honey” sold on many grocery store shelves. Bees have “honey stomachs” that they use to carry nectar back from the flowers, and into the hives to produce honey. The variation in plant nectars account for the variation on types of honey. Note the difference in color of the very light Mesquite Honey (in the exquisite photo ABOVE – taken by Ben Johnson; you can learn more about this talented man at ben@benjohnsonart.com) as compared with the deeper colored Cactus Flower honey (photo below). This simple facial mask takes us from our own pores to the pores of plants. As you can see in the photos, the honey produced inside the hive literally reflects the environment around it. When we plant a garden or keep a hive, we move from being being a food consumer, to a participant in our food production. So, too, with our health products. It is wildly fun, and often more economical, to use your own honey (or to purchase directly from a local beekeeper!!! That is a powerful act which moves you closer the “source”), than to purchase a prepared product. Honey has been used for skin repair and nourishment for thousands of years. Literally. It is a humectant, an anti-oxidant (darker, fall wildflower honey shows higher anti-oxidant levels than other types of honey, in scientific studies), and aroma “therapy” (is smells so, well, sweet!). The idea here is as much about the Ritual as the Result. Enjoy the smells and sensations WHILE applying the honey. Place the attention we so easily abdicate to the external world within once again. Our attention is rarely our own anymore, and a ritual as simple and everyday as washing our faces, can be a vehicle to practice enjoying the moment. 1) Exfoliate, however you like. This allows the properties of the honey to do their magic, without the barriers of dirt and oils. Rinse. (Facials are not for everyday … at least not in my world. I like to do the facial mask in the shower, on days when I wash my hair (which is not everyday) in order to utilize the humidity that the shower provides to open pores. (Water is a precious element in the desert, and I like to use Permaculture wisdom of “stacking functions” in order to lessen my water use.) Truthfully, I do this facial mask less frequently than I should. 2) Right as you apply your conditioner, apply the honey to your face. Then wrap up your conditioning hair in a towel and step out of the shower for about 20 minutes. Who knows … during those magical twenty minutes you might even the feel the flights of the worker bees, the “waggle dance” as specific foraging information is passed along, the way the flowers tip and bend in the breeze, the smell of flower, the sacred offering of pollen at dawn. Once you have soaked up both the tangible and intangible properties of the fall facial mask, rinse (both face and hair, if you are doing a duo) and apply your favorite facial cream. Your skin will GLOW. More Wild-Flower Foraging Fotos The photo above shows how the hairs on a bees body gather pollen; note head on left bee. The photos below show honey bees (and native bees) foraging in a variety of desert plants; and what “uncapped” honey looks like.